After a few months away from the market scene, I was a part of the inaugural Swagger Children’s Market on Sunday July 5th. Yes, it was the first. Yes, there were nerves. What about if no one came? I had been out of action both physically and mentally over the weeks in the lead up to the market and the thought of pulling out crossed my mind on many occasions. What was at the time a negative coming home from my last market in April with a car full of frames, now became a positive as I was able to use them all for Swagger. But then I looked at it all and hoped it was enough. There wasn’t all the items I had been planning for the market. When I got accepted for Swagger I imagined all the new things I was going to create. I looked in front of me and there was none of that. Nothing that made me think ‘wow’! I then re read my site information and I had a 1.5m stall. Why had I booked one so small? I know that a standard trestle is 1.8m and my A-frame shelf unit was also 1.8m wide. I really didn’t want to create a new stall setup. I had invested a lot of money into my existing one. I then had a thought about taking one of my A frames and adding smaller shelves. As you can see from my photo, it worked out (and only cost $20 and an hour of my hubbies time) to create this new look. Now the market has come and gone, how did it go? Well firstly I must say, the people did come. And they continued to come throughout the day. People came by themselves, with their hubbies, with their kids and with their prams. So many prams. I laughed at one stage when I looked at the entrance area and leaning against the wall were a heap of males with the prams/kids. They had given up and just allowed their other half to continue on shopping in the market! The venue was lovely. 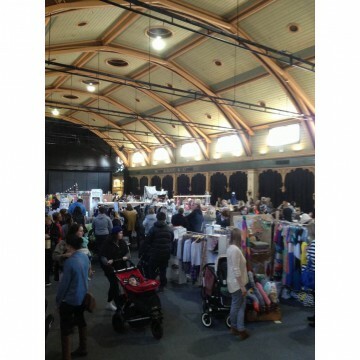 The old building had character and there was just the perfect amount of stalls in the hall to not make it look to full or empty. It was a chilly Melbourne day and being by the entrance was great in getting peoples attention as they arrived but it also meant it was bloody cold! The breeze came in and the jacket needed to stay on. So did I do well? Yes, I did come home happy. I went with no expectations like I usually do, so any sales were a bonus to me. 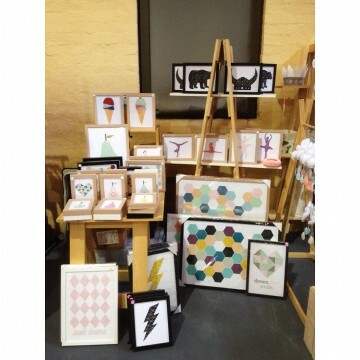 It was great to get on the spot feedback on the products I had on display and the geometric pears were the biggest hit. I also learnt about what people are wanting to buy and what I need to do to improve not only my stall setup but future markets. It is always changing and what works well at one market, may not work at another. My big regret was not having a good look at all the other stalls. The quick lap whilst we were all setting up wasn’t enough. It was on Instagram in the days following that I saw photos of people who were at the market and I couldn’t believe I didn’t look at their products more closely and introduce myself to them. Oh well… I will just continue to stalk their Instagram accounts! This is the first time in a while that I don’t have a market booked in the months ahead. Got some planning to do….